The 2018 TurboVote Summer Associates have arrived! Summer is finally here! 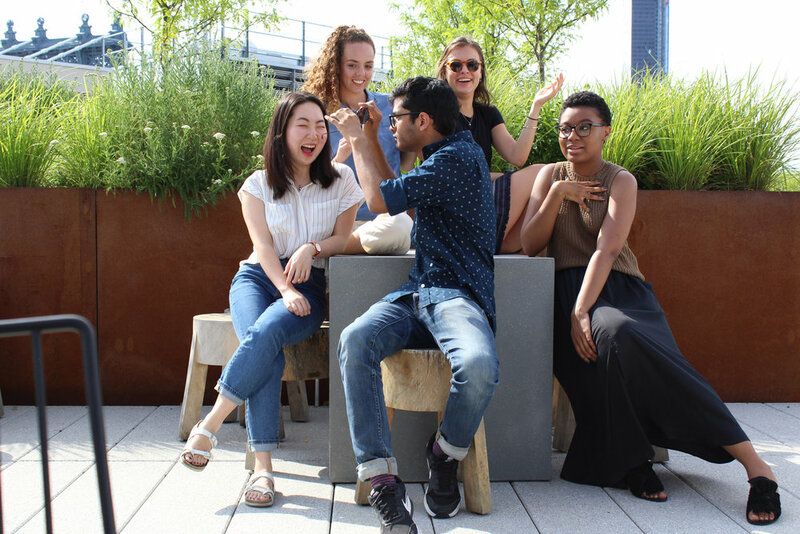 Along with the blistering heat came a cool new group of summer associates to the Democracy Works Brooklyn office. Jason, Jennifer, Piper, Thamara, and I arrived in Brooklyn and got right to work assisting the Turbovote Partnerships team. Even though we’re a group with diverse backgrounds and experiences, we share a passion for democracy and civic engagement and are driven to make voting easier for all Americans. Below, we’ve shared a bit more about ourselves, our interests, and our experiences. Hi! I’m Andrea Ferguson, a rising senior at Fordham University, majoring in business administration with concentrations in economics and marketing, and a minor in humanitarian studies. On campus, I’m involved with Fordham’s Hellenic Society, Women’s Club Lacrosse Team, and the Institute of International Humanitarian Affairs. I have a strong interest in how voting can influence policy, specifically related to socioeconomic issues, which is what brought me to Democracy Works for the summer. I plan on using my summer to listen to podcasts, spend time outside, and eat watermelon—or some combination of the three. Thamara Jean is a Hunter College graduate with a B.A. in political science and media studies. She has previously interned at Democracy Works as an executive support and fundraising associate and is returning this year as the senior summer associate. As a student at Hunter College, Thamara was a member of Generation Citizen and an Eva Kastan Grove Fellow for public service, public policy, and human rights. After the summer, Thamara will be reading for a master’s degree in political theory at the University of Oxford as a Rhodes Scholar. Jennifer Lee is a rising junior at Harvard College, where she studies computer science and government. On campus, she is a student coordinator for the Harvard Financial Aid Initiative, working to increase socioeconomic diversity at Harvard College, and a member of the Seneca, a women’s advocacy organization. She is also involved with theater and vocal music, performing with the Harvard-Radcliffe Dramatic Club and the Radcliffe Choral Society. In her free time, she can be found thrift shopping, on the beach, or lurking on Reddit. Originally from the California Bay Area, she is excited to be living and working in New York this summer. Jason Lalljee is a rising junior at the University of Chicago, where he is pursuing degrees in political science and English. At school, Jason is a news editor at The Chicago Maroon, a resident assistant, and a creative writing teacher to neighborhood kids who only ever want to write raps about Naruto. Democracy Works perfectly intersects Jason’s academic and extracurricular interests—community outreach, as well as combating voter apathy and suppression. In his limited spare time, Jason likes to talk about watching TV, talk about reading Harry Potter, and talk to friends who tolerate his talking too much about those things. He also loves his camera and will photograph any subject that lets him. Piper Serra will graduate from Tulane University in New Orleans, L.A. with a degree in political economy this December. Piper has worked at Tulane’s Taylor Center for Social Innovation and Design Thinking for two years as a marketing and design thinking fellow. She co-founded the Tulane chapter of Design for America, became a StartingBloc Fellow, and has interned with multiple local nonprofit organizations in New Orleans. She’s excited to be interning at Democracy Works because it gives her the opportunity to combine her love of nonprofit organizations and mission-driven social impact work with her academic background in politics and economics. The 2018 summer associates are excited to have the opportunity to work with such a driven team this summer. We can’t wait to spend the next ten weeks contributing, learning, and growing Democracy Works’s efforts to make voting fit the way we live! NEWS RELEASE: The Voting Information Project moves to Democracy Works, Inc.